Gonzalez and Wallace were elected on Nov. 7 in special elections to fill vacancies in the Georgia House–Gonzalez from House District 117 and Wallace from House District 119. Both districts include parts of Oconee County. Gonzalez told the Democrats gathered for their monthly meeting in November that they needed to provide financial support to her and Wallace now before the General Assembly meets on Jan. 8 and their ability to take campaign contributions is put on hold. Republicans planning to challenge them–as well as any Democrats–will not be restricted in their fundraising before the May party primaries and the general election next November. The roughly 25 Democrats assembled for the Nov. 21 meeting at the Chamber of Commerce in Watkinsville were in high spirits, and they clapped loudly when Gonzalez was introduced to them and at the end of her comments. Gonzalez defeated Houston Gaines 53 percent to 47 percent in the special election for the 117th on Nov. 7. The district is dominated by Clarke County but includes three precincts–Athens Academy, Malcom Bridge and Bogart–from Oconee County as well as parts of Barrow and Jackson counties. Gaines won 66 percent of the vote in Oconee County but Gonzalez won 64 percent of the vote in Clarke County. Gaines also carried Barrow and Jackson counties, but the tallies from Oconee and the other two counties were not enough to offset the vote in Clarke County. Wallace defeated three Republicans in the 119th, which includes the remaining 10 precincts in Oconee County and is roughly evenly split between Oconee and Clarke counties. Wallace only got 38 percent of the vote in Oconee County, but he received 76 percent of the vote in Clarke County. Across both counties, Wallace received 57 percent of the vote. Both House District 117 and House District 119 had been represented by Republicans prior to the special election. Angie Eells, chair of the Oconee County Democratic Committee since February, opened the Nov. 21 meeting with what she said were intended as inspirational thoughts. The latter was an oblique reference to the ongoing issue of sexual misconduct involving both parties. Eells gave a long list of characteristics she said reflect the agenda of the Democratic Party. “We are the party that fights for equal rights, for justice reform, and environmental protection,” she said. “We fight to protect programs to help the poor, women, children, and the elderly,” she continued. “We believe in science. We understand that we need universal health care, reduction in prescription drug costs, access to mental health treatment, and that women have reproductive rights. “With our victories in November, we now have something tangible to offer people when they say to us, “They’re all the same, and my vote doesn’t matter’,” Eells said. Eells said the Democratic Party in Oconee County is growing, with meeting size tripling in recent months. The group, she said, has four active subcommittees, focusing on communication, candidate recruitment, fundraising and special events, and membership. The goals for 2018 are to continue to grow membership, to seek candidates to run for office, and to prepare for the primaries in May and the general election in November, according to Eells. Gonzalez told the group that the support of women in the Democratic Party in Oconee County had been crucial to her and her campaign. “And we proved all that wrong, including the myth about you have to have the most money to win,” she said. Gonzalez said she raised $55,000 for her campaign and that Gaines raised more than $200,000. The next campaign finance report isn’t due until the end of the year, but Gaines reported raising $202,950 as of Oct. 30 and only spending $62,514. Republicans have a “war chest” and will keep adding to it leading up to the May party primaries and general election in November, she said. Gonzalez asked those present to make donations to her and Wallace before the General Assembly opens in January. “Send us to Atlanta with a bit of a buffer,” she asked. During the meeting on Nov. 21, Karen Hilyard asked for help from the members with a petition to recall Secretary of State Brian Kemp. Hilyard said the statewide goal is to get 780,000 signatures by Dec. 15 seeking Kemp’s removal from office. Hilyard said the petition is motivated by what she called a “purge of Democratic voters” from state voting rolls, data breaches of voting records, the destruction of evidence relating to those breaches, the lack of action on problems with the state’s voting machines, and Kemp’s decision to continue to oversee the elections next year when he is a candidate for governor. Hilyard said Wallace could not attend the county Democratic Party meeting in November because of memorial service in Louisiana. Normon Garrett, chair of Walton County Democratic Committee, was guest speaker at the Nov. 21 meeting. Garrett talked about the importance of turnout in elections and thanked President Donald Trump for rallying Democrats around the country to action. The meeting included committee reports and other components of the business meeting. The Republican Party, starting with its meeting on Nov. 16, has decided to close its business meetings to video and audio recording. I was not able to attend the Democratic Party meeting on Nov. 21, but Penny Mills did attend and video recorded the session. That video is below, and the estimate of the crowd size is from Mills. Mills repositioned the camera at several points in the beginning of the session to try to get the best angle, and there are short breaks in the video as she moved the camera. Eells’ comments begin immediately as the video starts. Eells introduced Gonzalez at 8:58. Hilyard’s call for action on the Kemp petition begins at 29:20. Garrett spoke starting at 33:37. 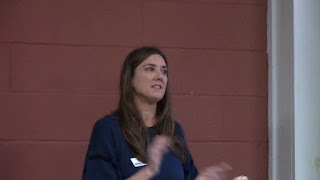 OCO: Oconee Democrats Meeting 11 21 17 from Lee Becker on Vimeo. Democrats were organized, engaged, informed, and excited. The State Party had internet information available, beamed into every Democrat's mailbox or device. Polling place locations, times, rides, and deadlines were well-publicized.